So my initial play time with BioShock 2 consist of no single-player yet as I was very curious about hot the multiplayer turned out. After about an hour or so of playing a few matches, overall it seems really well put together. ADAM serves as experience in the multiplayer and can be obtained in many different ways in order to level up and obtain more weapons, plasmids, and tonics. 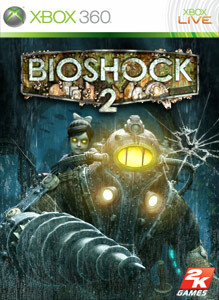 The game has many familiar multiplayer game-types with a BioShock spin to them. Capture the Sister has you locating the little sister in a map and transporting her while avoiding the other team. Pretty basic stuff except that a Big Daddy suit will randomly spawn in the map and really give the team who picks it up a definitive edge. I'm sure if it really belongs in objective game-types, but I'm sure tweaks can be made if the player feedback asks for it.